100 years of smart comfort. For nearly a century, Rinnai has been fiercely committed to delivering a smarter kind of comfort. With headquarters in Japan and a network of 20 subsidiaries and 86 sales offices in 13 countries, this commitment has made us one of the world’s largest gas appliance manufacturers. Our value-added products continue to stay in step with the demands of a changing world. The highest standards of quality. Rinnai employs more than 600 research and development engineers, all focused on uncompromising quality in design and manufacturing. Advanced automation and precision assembly processes have made our manufacturing facilities an industry model for efficiency. Throughout the world, our standards for quality remain unsurpassed. Dedicated Mode - With a dedicated return line, the integrated pump recirculates water from the tankless water heater through the return line and back to the heater. 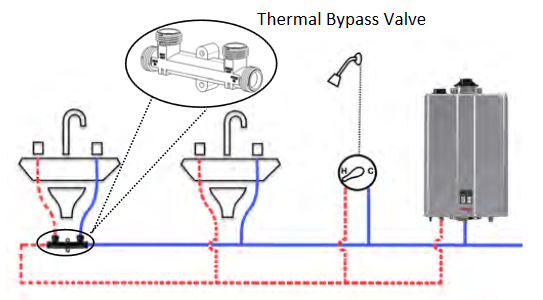 Crossover Mode - In applications where a dedicated return line is not available or is difficult to install, ThermaCirc360 technology allows for the simple installation of a Thermal Bypass Valve (included with purchase) at the fixture farthest away from the water heater. The Rinnai Sensei can go in an old condensing vent system for replacement if needed, but new installs can use smaller, lighter, less expensive concentric venting. A versatile design lets you handle variable installations due to varying stud alignment. Quick & Easy Gas Conversion: An inexpensive conversion kit requires just three simple steps. Convenient Isolation Valves + PRV: The pressure relief valve assembly can rotate 360o to accommodate the installation of isolation valves in any application. 12 Years for Residential Applications Installed by a Rinnai Trained Professional. See the website for more details.